Hike Through a Unique Terrain to Enjoy Nature and Wildlife. 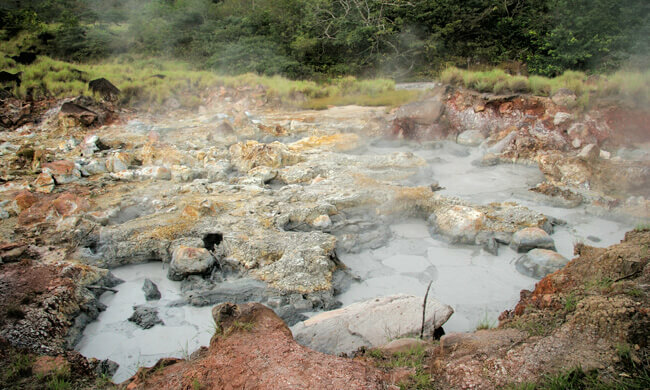 Rincon de la Vieja National Park is home to one of six active volcanoes in Costa Rica. Its last eruption happened in September 2011. However, it’s far from being in a dormant phase as it regularly makes rumbling noises and lets off steam. The park features many unusual features such as volcanic rocks and dried lava flows, with moist humid forests and cloud forests growing in between. There are also bubbling hot mud pools, eerie steam holes, sulphurous fumaroles, waterfalls, and beautiful jungle trails to explore! The tour starts as the transport picks you up from the hotel after breakfast and takes you to the national park*. Enjoy a two-hour hike around the park exploring its unique terrain and spotting a variety of wildlife: the white-faced monkeys high in the trees, green iguanas, and cute raccoons. This park is known as a birdwatcher’s paradise, as well. You can spot birds such as the yellow-ear toucanets, rusty sparrows, and black-eared wood quails! If you are lucky, the lesser ground cuckoo may make an appearance, too. The hiking trails will lead you to the stunning, 195-foot high La Cangreja waterfall. Rincon de la Vieja National Park is an off-the-beaten-track park, as there aren’t many tourists visiting the area. If you are looking for a great wildlife experience with somewhat extreme hiking involved and are in good physical condition, this is definitely an area for you to explore! After hiking, you’ll continue to get to know lesser-known parts of Costa Rica during a tour of Liberia, the capital of Guanacaste. The “Texas of Costa Rica” is known for its heat, its size, and its cowboy culture, and Liberia is a great introduction to the region. With your guide, you’ll learn about Guanacaste’s history and will get a chance to do some souvenir shopping. Make sure to try some corn-based pastries, one of the region’s signature differences from the rest of the country’s cuisine. Tour includes: transportation, lunch, drinks, guide, entrance into the park, tour of Liberia. What to bring: hiking boots / trail shoes / very sturdy sneakers with grip, long pants or shorts, T-shirt, cap or hat, binoculars, camera, sunscreen, insect repellent, cash for shopping in town. *Please note that drive times may vary, depending on the location of your accommodation.